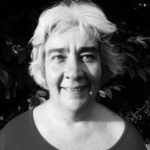 Janet Hawtin Reid (@lucychili) sadly passed away last week. A mutual friend called me a earlier in the week to tell me, for which I’m very grateful. We both appreciate that BlueHackers doesn’t ever want to be a news channel, so I waited writing about it here until other friends, just like me, would have also had a chance to hear via more direct and personal channels. I think that’s the way these things should flow. I knew Janet as a thoughtful person, with strong opinions particularly on openness and inclusion. And as an artist and generally creative individual, a lover of nature. 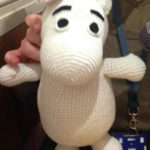 In recent years I’ve also seen her produce the most awesome knitted Moomins. Short diversion as I have an extra connection with the Moomin stories by Tove Jansson: they have a character called My, after whom Monty Widenius’ eldest daughter is named, which in turn is how MySQL got named. I used to work for MySQL AB, and I’ve known that My since she was a little smurf (she’s an adult now). I’ve used a star as the current one does [an earlier doodle incorporated the Southern Cross]. The 7 points for 7 states [counting NT as a state]. The feet are half facing in for collaboration and half facing out for being expansive and progressive. You may not have realised this as the feet are quite stylised, but you’ll definitely have noticed the pattern-of-7, and the logo as a whole works really well. It’s a good looking and distinctive logo that has lasted almost a decade and a half now. As Linux Australia’s president Kathy Reid wrote, Janet also helped design the ‘penguin feet’ logo that you see on Linux.org.au. Just reading the above (which I just retrieved from a 2004 email thread) there does seem to be a bit of a feet-pattern there… of course the explicit penguin feet belong with the Linux penguin. So, Linux Australia and OSIA actually share aspects of their identity (feet with a purpose), through their respective logo designs by Janet! Mind you, I only realised all this when looking through old stuff while writing this post, as the logos were done at different times and only a handful of people have ever read the rationale behind the OSIA logo until now. I think it’s cool, and a fabulous visual legacy. 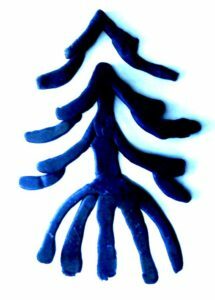 Fir tree in clay, by Janet Hawtin Reid. Done in “EcoClay”, brought back to Adelaide from OSDC 2010 (Melbourne) by Kim Hawtin, Janet’s partner. Which brings me to a related issue that’s close to my heart, and I’ve written and spoken about this before. We’re losing too many people in our community – where, in case you were wondering, too many is defined as >0. Just like in a conversation on the road toll, any number greater than zero has to be regarded as unacceptable. Zero must be the target, as every individual life is important. There are many possible analogies with trees as depicted in the above artwork, including the fact that we’re all best enabled to grow further. Please connect with the people around you. Remember that connecting does not necessarily mean talking per-se, as sometimes people just need to not talk, too. Connecting, just like the phrase “I see you” from Avatar, is about being thoughtful and aware of other people. It can just be a simple hello passing by (I say hi to “strangers” on my walks), a short email or phone call, a hug, or even just quietly being present in the same room. We all know that you can just be in the same room as someone, without explicitly interacting, and yet feel either connected or disconnected. That’s what I’m talking about. Aim to be connected, in that real, non-electronic, meaning of the word. If you or someone you know needs help or talk right now, please call 1300 659 467 (in Australia – they can call you back, and you can also use the service online). There are many more resources and links on the BlueHackers.org website. Take care.